I know what you are going to say. You really do not need yet another muffin recipe. You most likely have already marked many pages of your cookbooks featuring muffin recipes on them. My view on it? Another muffin recipe is never going to hurt. “Vous ne la sentirez pas passer.” Instead, it will give you many more options. So what would you say of a muffin recipe with a French flair, a treat for your Sunday Easter brunch if this is what you decide to do? I was perhaps not born with muffin gene running through my veins, but I have learned to understand and love them all the same. 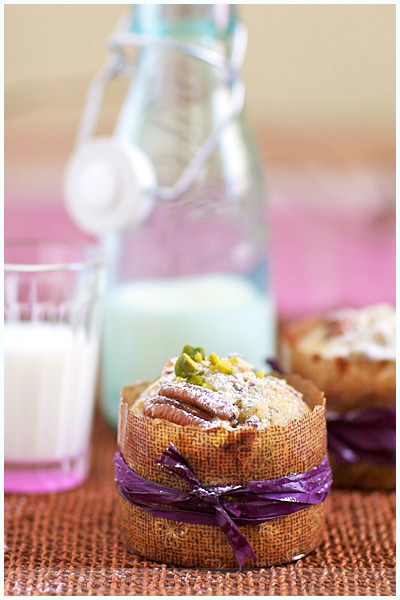 The first special twist to this muffin recipe is that the cakes are baked in cute-looking paper cases, the ones seen around on many food blogs, including mine too. The second thing is that beside green pistachios, pecans and dark chocolate, the recipe uses two types of flours — all-purpose and almond — for a more pronounced taste and a firmer texture. I wrote this muffin recipe for the Boston Globe’s Food Section this past Wednesday. Check it out here. Trust me when I say that these never last long if you are close by, especially when they come right out from the oven. They are a keeper. On another note, I was honored and excited to hear yesterday that La Tartine Gourmande was mentioned with thirteen other talented food bloggers — Keiko, David, Karen, Melissa, Heidi or Clotilde, to only name a few — in an article entitled “14 Foodie Travel Blogs To Savor” on IgoUgo, a travel site part of Travelocity. Since you know how much I love to write Food & Travel stories, I was really thrilled. A big thank you to the editor for mentioning my blog. That truly inspires me to travel, snapshot and write even more! Gorgeous recipe Bea. Love the addition of almonds in this. Ils donnent vraiment envie tes muffins et quelles photos!! Absolutely gorgeous! You can keep adding muffin recipes because I love them. Congrats on the article! Those muffins look too beautiful to eat! 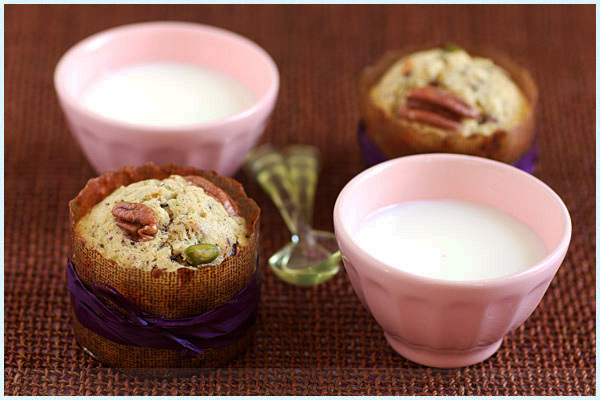 I like thi muffin a lot… and the photo composition is perfect! 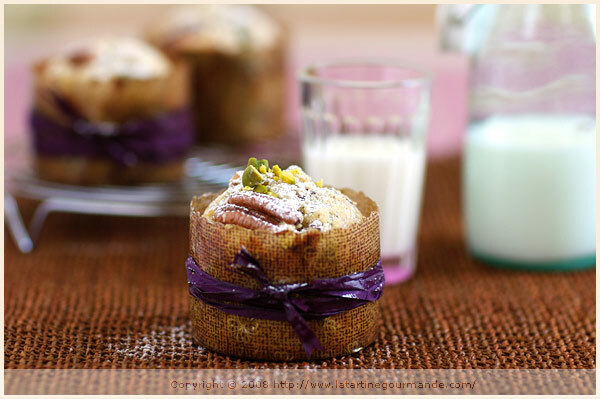 You can never have too many muffin recipes, particularly ones that contain pistachio and that embody beauty. Uh-oh, now I’m feeling snack-y. Thank you for this great Easter Sunday brunch idea! I am with you, there ain’t no such thing as too many muffin recipes. The little paper containers you used look like a mini version of the paper sleeve of an Italian panettone, very handsome. Almond flour is such a fine thing to use, I am so grateful that here in Vienna every grocer has it on its shelf and at a great price to boot. Another Globe recipe and another honor! You go girl! I firmly believe you can *never* have too many muffin recipes! Then again, I’m obsessed with muffins… Congrats on the article! that is wonderful Bea! Congratulations! and Happy Easter. crois tu que la poudre d’amande fasse l’affaire ? The muffin presentation is adorable for any Sunday brunch. Congrats on your latest achievements. Well-deserved! Bea, your recipe says to Coat inside surfaces of the paper baking molds with sugar, tapping out the excess. Is it to ease the removal of the muffin or simply for taste? I love the new color palette of your site — so springlike and cheerful. Kim, the sugar coating is to give more taste to the muffins, like a tiny touch of caramel. The cases will stick to the muffins, and to remove them, you have to peel them off. They sound wonderful and it never hurts to add another muffin recipe to the repertoire. wow, these look wonderful! I dont often see pistachio/pecan duos… but Im sure that with the chocolate all 3 flavours must taste fantastic! Beautiful photos too! i fully agree that one cannot have too many muffin recipes. especially when they’re as yummy as this one. because who knows what muffin you’ll be drawn to when the mood strikes? Just the thought of almond flour gets me excited. I’m not so much a muffin girl, but I think these could win me over. Thanks, Bea! How I have missed my Béa! Everything looks so beautiful. Have a very happy Easter! Muffins are one of my favorite things to bake! This is a silly question but where do you find those adorable paper cases? Amy, the article in the Boston Globe gives you the contact. I found these at my local Sur La Table. Check it out. Good luck. Hi Bea! I just baked the muffins and they were delicious! Unfortunately the link to this recipe is not accessible. I would so appreciate it if you could forward this recipe to me. Thanks.